Over the last couple of months, I’ve been churning out veganized versions of recipes from my childhood. Thumbprint cookies, vegan sloppy joes, spinach dip, and, most recently, this vegan mushroom stroganoff as a Hamburger Helper throwback. For readers who didn’t grow up in the United States, Hamburger Helper comes in many packaged forms, most famously with noodles, ground beef, and gravy sauce. I won’t knock the original but I will praise this reproduction for bringing out all the right flavors in a significantly fresher and healthier way. It’s been unexpectedly satisfying to use different ingredients, ones that are now so ingrained in my adult life, to reproduce the same flavors of my youth. Triggering nostalgia by intentionally incorporating new with the old is a super fun philosophical concept that makes me simultaneously thankful for my past and present. Whether or not you can relate to this particular dish, I encourage you to think about what meals from your past you might be able to revive with new flair. 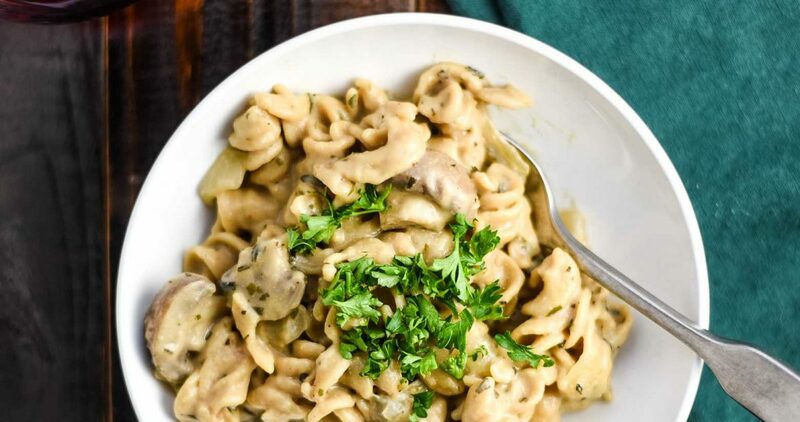 How do you make vegan mushroom stroganoff? Part of the beauty of this recipe is that you can make it in one pot which means only one dish to clean. Simply chop your onion, garlic, and mushrooms, cook for a few minutes in some oil, then add your noodles, vegetable broth, nutritional yeast, salt, and pepper. Cook until the pasta is finished, remove from heat, and stir in cashew butter to increase richness and lemon juice to provide some finishing acid. What mushrooms work best in this recipe? This recipe is flexible, so feel free to experiment with your favorite or most convenient options. In this version, I used cremini mushrooms. 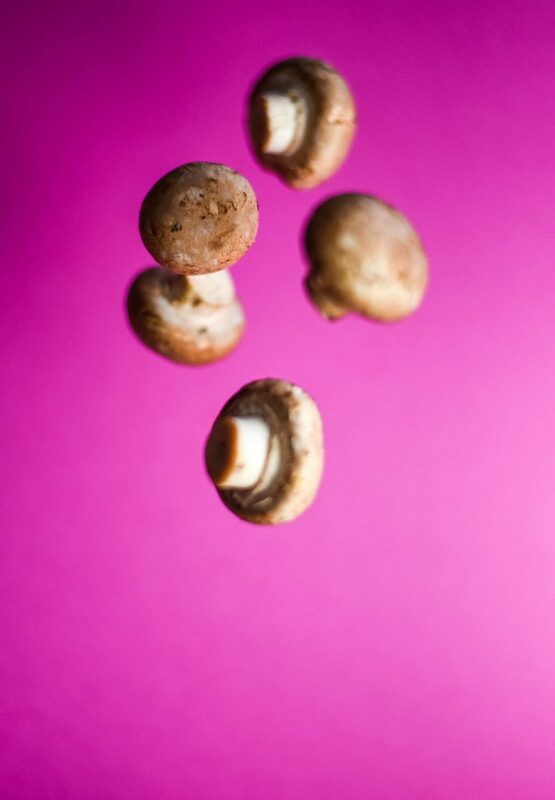 You could also try shiitake, oyster, and portobello. 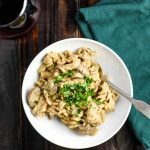 What should I pair with mushroom stroganoff? If you’re feeling the carbs, add a piece of warmed, crusty bread. If you want to lighten the meal, try a simple side salad. Either way, I recommend a glass of wine to really drive home the concept of adult Hamburger Helper. The earthiness of the dish also allows for some really delicious wine pairing options. More on that below. Pinot Noir: Adds light red fruits like raspberry, strawberry, and cherry flavors while also introducing earthy, woodsy, mushroom notes. Will also pair nicely with the herbs in the meal. Rioja: Usually made from the Tempranillo grape, Rioja is a good option if you’re looking for something fruity and juicy without overwhelming your tastebuds with strong tannins. Rioja has a bit more straightforward character and a touch of smokiness that complements mushrooms. Cava: if you want to drink something different for dinner, go with a bubbly brut (dry) Cava. 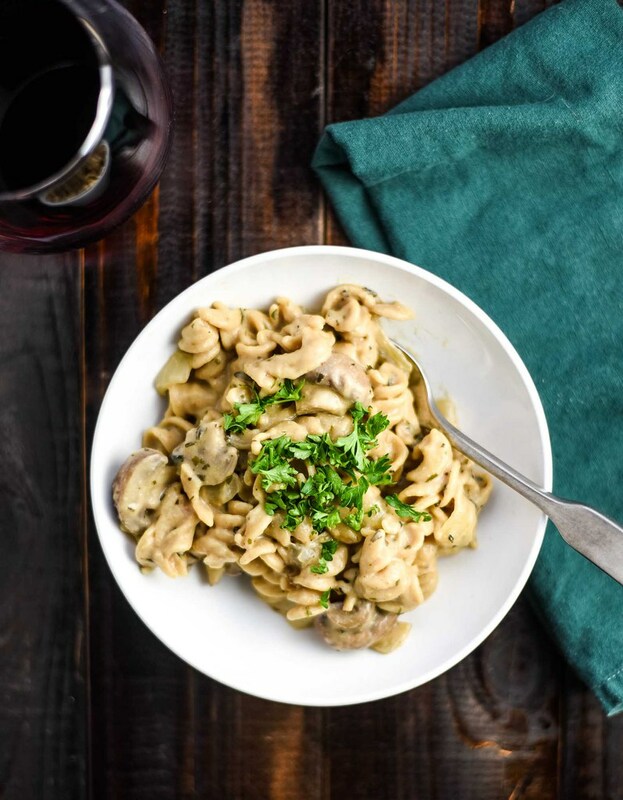 The bubbles will cut through creamy sauces, while the traditional method of aging sparkling wines gives the wine yeasty depth and complexity to complement a diversity of seasonings and mushrooms. 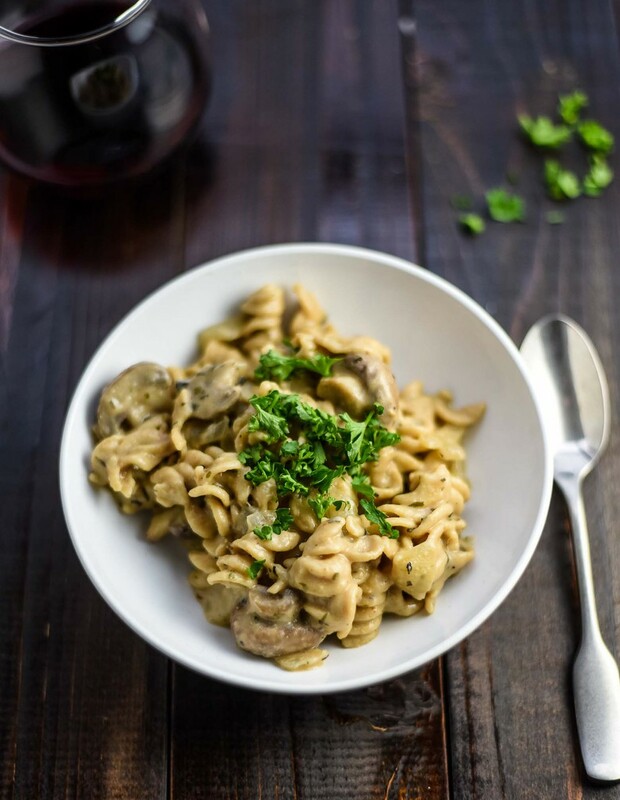 Hearty, delicious, and easy to make vegan mushroom stroganoff recipe. Perfect when you’re hungry for a comforting meal. Add olive oil to a large pot over medium heat. When warm, add in the chopped onions and garlic and cook until fragrant and beginning to soften, about 3-5 minutes. Add in the pasta, mushrooms, veggie broth or water, nutritional yeast, basil, thyme, marjoram, and onion powder, and black Pepper. Bring to a boil and let simmer uncovered for 10-15 minutes, stirring occasionally. Make sure pasta is fully cooked before taking off heat. Turn the heat off, then stir in the cashew butter and lemon juice until evenly mixed. Add additional salt and pepper to taste, as needed. Top with freshly chopped parsley and black pepper, and serve warm. Store in a covered container in the refrigerator for up to four days.